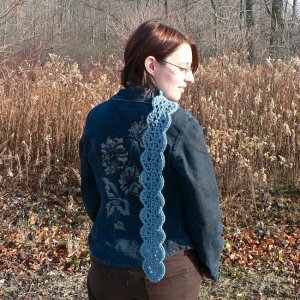 Scalloped Scarf is an original PlanetJune Accessories crochet pattern by June Gilbank. Make this pretty and versatile scarf with almost any yarn you have to hand – it’s a quick and stylish one-skein project, and makes a perfect gift! Details: Pattern includes full written instructions, charted stitch diagram, and instructions for resizing the pattern to make it longer or shorter. Date Added: 07/31/2014 by Maureen R.
Date Added: 09/20/2012 by Rebecca P.
Date Added: 12/20/2011 by Chrisie M.
Date Added: 10/31/2011 by Renee T.
Date Added: 03/29/2011 by Bridget V.